So normally I would serve this sauce over cube steak. However, I had these tender, little steaks (not even sure of the cut) in my freezer and decided to use them instead. Overall, the sauce is very versatile and works with many cuts of meat. However, my oldest son loves cube steaks…go figure, so I usually make this for him using that particular cut. Cube steak does cook up quickly and is very inexpensive, making this a very easy weeknight meal. If you end up using a thicker, cut of beef, you will have to increase the cooking time (about 8 minutes per side) in order for the meat to have reached medium. You also have the option of slicing the beef thin after you have cooked it and serve it, with the sauce over rice or noodles. This meal makes getting dinner together a snap. It’s so easy and ready in about 20-30 minutes. Sprinkle steaks with 1/2 teaspoon pepper and salt. Heat 1 Tablespoon oil in a large nonstick skillet over medium heat. Add steaks and cook, turning once, until browned and cooked through, 1 to 2 minutes per side for medium if you are using cube steak. If you are using a different cut of meat, cooking times will vary. (If necessary, cook in two batches.) Transfer the steaks to a plate and cover to keep warm. Add the remaining 1 Tablespoon oil to the pan. Add mushrooms, shallot and the remaining 1/4 teaspoon pepper; cook, stirring until the mushrooms are golden brown and release their liquid, 4 to 5 minutes. Sprinkle with flour and cook, stirring, for 1 minute. Add thyme, sherry and broth; bring to a boil and cook, stirring, until thick enough to coat the back of a spoon, about three minutes. Remove from heat and stir in sour cream. Return the steaks (and any accumulated juice) to the pan and turn to coat with the sauce. Add the remaining 1 Tablespoon oil to the pan. Add mushrooms, shallot and the remaining 1/4 teaspoon pepper; cook, stirring until the mushrooms are golden brown and release their liquid, 4 to 5 minutes. Sprinkle with flour and cook, stirring, for 1 minute. Add thyme, sherry and broth; bring to a boil and cook, stirring, until thick enough to coat the back of a spoon, about three minutes. Remove from heat and stir in sour cream. Return the steaks (and any accumulated juice) to the pan and turn to coat with the sauce. To make this recipe for two: Halve all ingredients except oil; use 1 Tablespoon oil to cook the steaks and 2 teaspoons oil to cook the mushrooms and shallot. Oh I love the idea of this sauce, so quick and easy!! Mmm, what a family friendly dish. Thanks for figuring out what we’re having tonight for dinner. 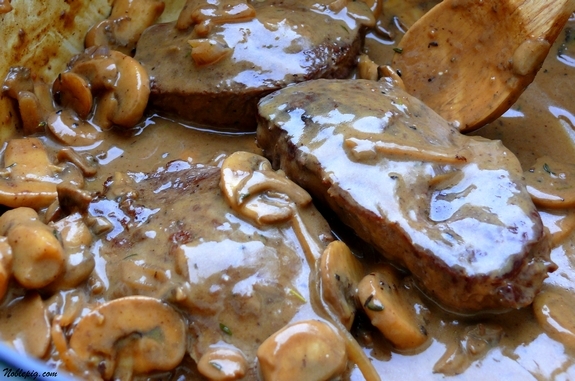 Is it weird that I now want steak with mushroom-sherry sauce for breakfast?! Don’t you just love Eating Well? I’ve never ever tried a cube steak before. Always thought they’d be tough. I’ll have to give them a try. This recipe looks right up my alley! Love pan sauteed steak and that gravy looks wonderful. AND it looks like a quick no-fuss meal. YUM! This is a lovely sauce and so easy. I love you photo!!! Great sauce. I would love this over hamburgers for a change up. LOve how silky this mushroom sauce look. It is really appealing. I think it’s such a perfect sauce for steak. Wow, this mushroom sauce looks amazing. I love the sherry to beef broth ratio – so often there’s not enough of one and too much of the other. This looks perfect! The mushroom sauce looks wonderful! I have a bunch of petite steaks in the freezer and usually I just marinade them and either grill or broil, but this recipe looks so delicious! And is it any coincidence that I’m completely regretting not taking any of those steaks out to thaw! I have everything on hand to make this…except for thawed steaks! Drat! Seriously Cathy – you have thee best food blog (and I read many) — these look superb and so do-able! That is saying a lot for me…as I seem to fail consistently on meat dishes. Thanks for your efforts, sharing of your multitudes of talent! Looks excellent! I think that sour cream in a sauce can be a transformative element. It looks a bit like a stroganoff. I love a fussless meal like this! Wowsers! I’m such a *ho* for sauces. You know, I’ve been buying these odd little tenderloin steaks at the store called by another I can’t remember & they have a little more tendon in them than a tenderloin fillet. But, they are much less expensive & perfect for a dish like this. Besides, the sauce is what it’s all about. Isn’t it amazing what a couple of tablespoons of sour cream can do to a sauce? Again, wowsers! I’m so glad I’m not the only one who “invents” a cut when uncertain! This sauce looks wonderful! I have studiously stayed away from this all day as the title alone make my stomach growl. Now you’ve done it! I am so going out for steak tonight! This looks awesome! I’m not a mushroom fan, but I would totally try that. It just looks so good. Your son seems to be my oppsite. When I was a kid I’d eat just about any steak BUT cube steak. 😀 I do love your mushroom sauce. Totally up my alley. I’d do this sauce with any number of cuts. Cube steaks, now why didn’t I think of that. You are right they are perfect for a meal in a flash. I am adding them to my grocery list. Thanks Cathy! 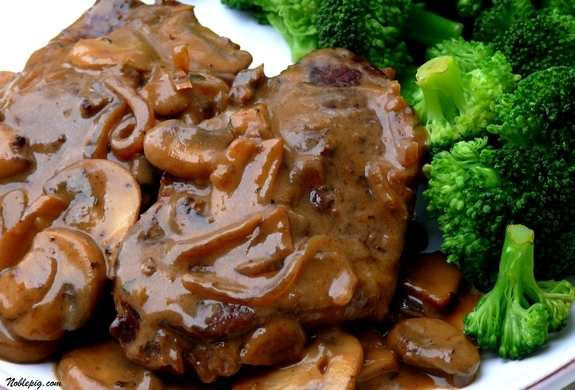 This is kind of similar to your pork chops marsala recipe, which I adapted last weekend. I added thyme (just like THIS sauce), then asked my son to taste it and make suggestions. He thought for a moment, then said, “A little lemon juice and some freshly ground black pepper is what would make it even better.” And indeed it did! If I could I’d probably put a sauce like this over pretty much any steak. I love mushrooms sauces with a bit of sour cream! May have to pick up a few cube steaks next time I’m at the store. My hubby loves cube steak too and I would love to make this for him. Gotta love a meal done in 30 minutes or under! The mushroom-sherry sauce WOULD be good on almost any beef, and I think it would be yummy without any meat at all, but poured over noodles! Mushrooms and steak just seem to go together naturally. 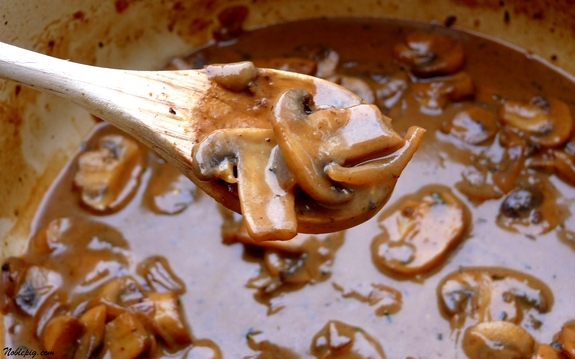 Such a rich and delicious mushrooms sauce, yum! My bowl of soup for dinner seems so boring now. This meal looks fantastic!! I was just looking for a great mushroom sauce to serve with our steaks this past weekend. Thanks for the recipe! I’m definitely going to try this next time we have steaks. Yum! My kids won’t touch a mushroom-but me and the hubs would love this! 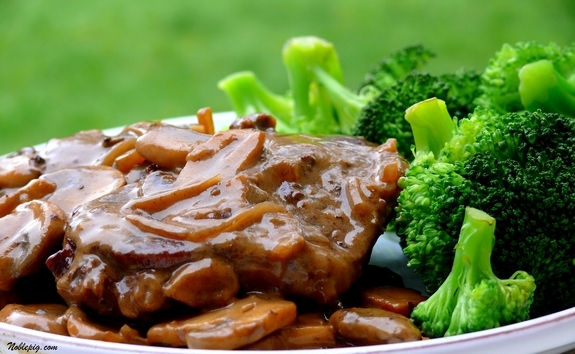 The mushroom sherry sauce looks delicious! Nice to hear that it’s versatile. Made the sauce with roast for dinner tonight. Was really good! Not sure if I used the right sherry though.